If you're tired of ugly sweater themed events, consider throwing a Christmas tree decorating party instead. Trimming the tree is a memorable event in most households, but the process usually involves the immediate family only. Hosting a tree trimming party extends the occasion to close friends and relatives and adds more purpose to your usual holiday get together. Your tree trimming party can be adult themed or it can be kid-friendly. Either way, these ideas will get you started. The date, time and address of the party. Remind everyone to bring one ornament for the tree or for an ornament exchange. Specify a theme or color scheme if there is one. Have your tree set up days in advance and put on any string lights prior to the party to create ambiance. Make a holiday playlist with your favorite holiday music and have it ready to stream. Keep all your holiday and party decor within a certain style or theme, like rustic or modern. Put away more everyday decor and create spaces for a food station and an ornament station. Add more seating areas as well using floor pillows or extra chairs. Even though you may request your guests bring an ornament for the tree, it's important to already have the basic tree trimming essentials on hand. To keep your tree somewhat unified, set out some basic ornaments within a particular color scheme next to the tree. 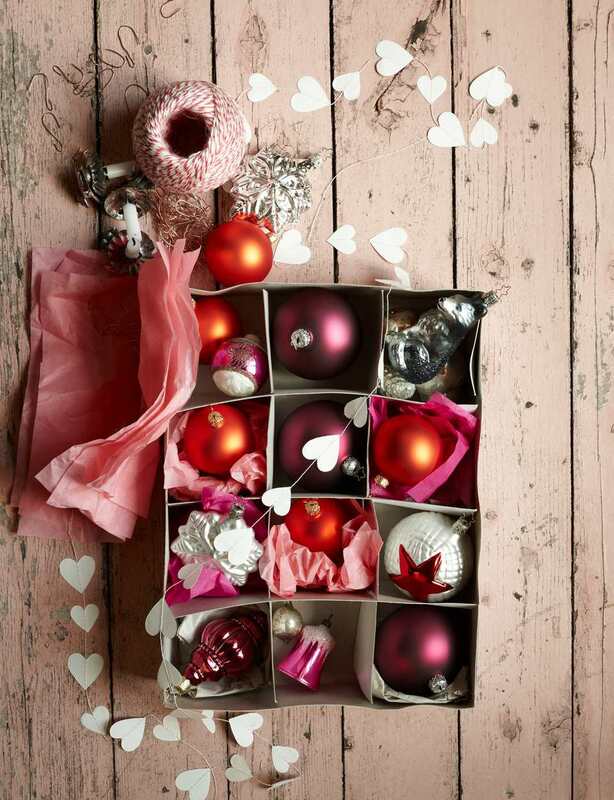 For this set up to look extra polished, place ornaments in wood crates at varying heights. Prior to planning your ornament station, first pick out a few different DIY ornaments your guests can create when they arrive. If the ornament is complicated, include printable instructions and make sure you have all the supplies needed. There are a variety of ornament projects, but be sure to pick some with varying skill levels needed. You may even want to have two ornament stations—one for adults and one for kids. A fun project to add to your ornament station is an old world garland, which is one of those tree trimming accessories that is often overlooked. Trust us, stringing together your own garland is much more fun in the company of others, and it will help people who may not otherwise interact get more acquainted. This handmade cranberry and popcorn garland might not be suitable if you have pets or small children in your household, but there are many other types to try. When guests arrive, request volunteers for garland making and be sure they have fun with it. This idea is perfect if you are throwing a tree trimming party for a group of kids. Create a special table where guests and their little ones can decorate their own tree to take home as a party favor. These mini spruces are inexpensive and can be just as fun to trim as their larger counterparts. Setting up this station is pretty simple. Find some plastic containers from the dollar three, then add "Trim a Tree" in vinyl letters. Lastly, place some smaller plastic ornaments inside. Altogether, the ornaments and containers shouldn't cost you any more than $20. Great parties are made even better when some thought has been put into the menu. If you're throwing a holiday party on a budget, there is no need to go overboard. However, serving at least one themed drink will be a memorable touch. You can either opt for a traditional Christmas cocktail or choose one that is evergreen inspired. It might seem obvious to include some Christmas tree inspired food to your menu, but you'd be surprised just how many festive recipes are out there. Decide whether you want to serve an entire meal or just offer appetizers and dessert. Since the bulk of this get-together revolves around tree trimming and not a sit-down dinner, you should be fine with simple finger foods. Just be sure your guests know what type of food you'll be serving in advance so they know whether or not to expect a full meal. You can accomplish this by adding a line like "Light fare and drinks will be served" on the invitation. Christmas tree shaped cheese board or veggie platter appetizer. Elevated cupcake or cookie tower in the shape of a tree. Pinwheel mini sandwiches placed on a platter in a tree shape. Photo booths have become rentals of choice for weddings and other large gatherings, but you don't need some rental to encourage silly photos at your party. Get some fun photo props and set up a photo station right next to the tree. When guests arrive, remind them to take photos by the tree using the props. Include a chalkboard sign with the year that guest can also hold up in their photo. The main point of the party is trimming the tree, but this doesn't have to be done in a boring way. Once everyone has had a chance to make an ornament, gather everyone for a tree trimming game. So long as the gathering isn't too large, this will give everyone a chance to interact as a whole while adding some fun to the tree trimming process. For example, one game idea is to do an ornament gift exchange using the white elephant gift exchange rules. For this, guests will need to bring one wrapped ornament. Give the game a tree trimming twist by having everyone add another ornament to the tree before and after their turn.